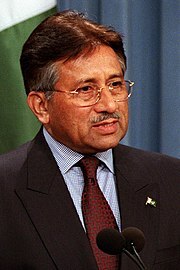 Pervez Musharraf announced in a speech that was broadcast today on national television that he will resign from his position as President of Pakistan. He had been facing impeachment on charges of violating the constitution and gross misconduct. The hour-long speech started at 13:00 local time (07:00 UTC). In it, Musharraf explained in Urdu his reasons for resigning. The former President explained that, “even if I beat this impeachment, relations between the presidency and the government can never be fixed.” He said that he believes that “pillars of the state – parliament and the judiciary – would be harmed and, God forbid, the army might have been dragged in,” if he did not resign. Despite his resignation, he remained adamant that the charges against him are incorrect. “Not a single charge can be proved against me,” he emphasized. Just three days ago, the chief spokesperson for Musharraf denied reports that came out Thursday indicating that the president would step down within days. Today Video Barack Obama in Berlin. Barack Obama addresses a crowd of over 200,000 people in Tiergarten, Berlin.